Who doesn’t want to have a great glowing skin? Our facial skin is especially exposed and prone to damage that is quickly evident on the way we look. But not only external factors like UV radiation and pollution damage our skin. It appears to be that what we eat can affect our hormone balance, cause acne, and create or improve inflammation, which affects skin aging. According to the scientific magazine, Clinical Biochemistry, food can affect the production and secretion of hormones by direct actions on the gut. We tend to spend a lot of money on expensive creams and serums, but what we eat can be as important. The hormones in our body serve a very important role. Our body relies on hormones to function properly. As they are so important for us to function properly, their lack causes our bodies to very slowly stop functioning, or what we refer as aging. Aging affects some people more than others, but very much it affects women in more dramatic ways. Our food, especially healthy fat, helps us to maintain hormonal balance. Aging from external and internal factors can cause deep wrinkles and hyper-pigmentation, and is a natural process, governed by our own body’s biological clock. Dryness, fine wrinkles and dull skin are all part of the natural process. Many internal factors are involved in skin aging: genetics, inflammation, decreased lipid production and decreased hormone levels. These hormone changes are now being more closely researched to find out just how important they are to skin health, especially in women. So let’s have a look at the best 20 foods to balance your hormones and give you glowing and healthy skin. 1. Coconut Oil – Coconut oil is definitely one of the most effective foods to start your journey to healthier skin and more balanced hormones. Coconut oil provides your body with the essentials for hormone production. Studies have shown that populations which have a diet high in coconuts are among the healthiest and most youthful looking people in the world. For example the Tokelauans islanders of the South Pacific. My favorite way to get my daily coconut oil is to mix it in my coffee every morning, or you can add it to your smoothies. You can find here more information about the amazing health benefits of coconut oil. Using more coconut oil in your daily routine is also one of the 70 habits featured in my e-book 70 Powerful Habits For A Great Health which will guide you how to take positive steps to improve your wellness and overall health. 2. Almonds – Almonds are stuffed with vitamin E which helps improve the appearance and condition of your skin; while also helping to protect your skin from the sun’s harmful UV rays. They also contain zinc, which balances your mood. Volunteers who consumed 14 milligrams of the vitamin per day (about 20 almonds) and then were exposed to UV light, were burned less than those who took none. Vitamin E also happens to be an antioxidant, which cleverly works to keep your arteries clear of harmful free radicals. You can read more about the great health benefits of nuts, almonds and seeds. 3. Eggs – Eggs have been proven to increase levels of HDL cholesterol or ‘the good kind of Cholesterol’. This type of cholesterol is the building block of hormone creation. Eggs are also a fantastic protein source, and hold a cornucopia of your everyday essential vitamins. Among these vitamins are choline, lutein, and iodine, which are most important for healthy, full, and functional skin cells. 4. Whole-grain foods – They taste good and they make you look and feel good. What’s not to like? Just make sure you go for true, natural, whole grain bread, pasta and cereals. These are rich in B Vitamins which promote cell production, thus making your skin look radiant and dewy. If having beautiful skin isn’t enough to make you happy, then the serotonin (a calming hormone, produced from tryptophan, which is found in whole-grains) can lift your mood. 5. Coconut Water – They say the most effective way to moisturize is from within, and you can do just that by drinking delicious coconut water. It is full of natural properties which hydrate the skin and make it glow. Lots of antioxidants (which help remove free radicals from the body that can damage skin) are also found in this ‘dew from the heavens,’ to which it is sometimes referred. Find more about the health benefits of coconut water here. 6. Turmeric – This ‘golden goddess,’ which fans of the spice call it, balances female and male hormones. You can use it to enhance the flavor of lots of food such as meat, seafood, rice, vegetables and potatoes. Read here my article about the fantastic health benefits of turmeric, including a golden milk recipe to cure many ailments. 7. Broccoli – It may sounds like common sense saying that broccoli is good for you. Broccoli is rich in vitamin C and vitamin E. These vitamins aid with collagen production and UV ray protection. Read here more about the health benefits of cruciferous vegetables. 8. Water – Water is essential for your body’s health. Every cell in your body needs water to remain healthy. If you don’t glug at least 6 – 8 glasses a day, your skin will become dry, which will make you more prone to wrinkles. So save money on anti-aging cream and drink up. 9. Oranges – High in vitamin C, orange is next on our list. 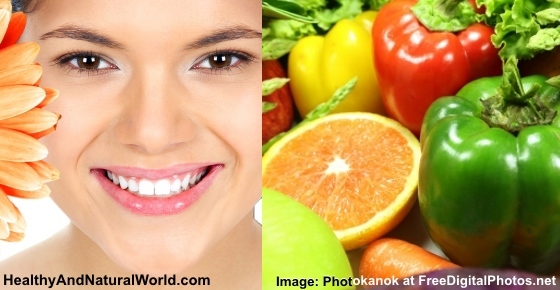 The vitamin C found in oranges, and most citrus fruits, is extremely beneficial to the skin. It is needed to create collagen or ‘skin protein’ and helps stop hyper-aging free-radicals from wreaking havoc on your body. 10. Avocados – Avocados are super at moisturizing your skin’s epidermal layer, making it look beautifully radiant. The omega 9 fats found in avocados help to repair damaged skin cells and calm redness and irritation. One scientific study found the avocado consumption can support healthy aging. They are also packed with fiber, potassium, magnesium, folic acid and vitamin E, C and B-vitamins – all of which are needed for maintaining hormonal balance in the body. 11. Dark Leafy Greens – Dark leafy greens like broccoli and spinach boast anti-aging antioxidants and high levels of lutein which hydrates skin and improves elasticity. Improving your diet is as easy as adding spinach to your salad or smoothies. 12. Oysters – Did you know that this shellfish is actually full of zinc that your body needs to produce testosterone? It also is a huge factor in skin renewal and repair. 13. Garlic – Garlic contains allicin which helps to kill off harmful bacteria and viruses in your body, including acne and other skin infections. As if that wasn’t enough, tasty garlic also packs in antioxidants, which as we know, are great for you and your skin’s condition. You may also be interested to read my article how to use garlic as a medicine. 14. Dark Chocolate – Dark chocolate moisturizes skin, reducing redness and roughness. The cocoa flavonols in dark chocolate help fight sleep deprivation, fatigue, and the effects of aging. You know why eating chocolate makes you feel so good? Well that’s because it reduces your stress hormones. In addition to this wonderful news, it has a little caffeine in it for that extra pep. Read more about the health benefits of dark chocolate here. 15. Chaste berry (vitex) – (Women only) Coming from a little known Mediterranean flower bush, this fruit works by halting the release of prolactin from the pituitary gland. High prolactin levels have been known to cause irregular menstrual cycles or even the absence of periods, as well as acne. 16. Kiwifruit – This little fuzzy fruit is filled up with more vitamin C than an orange, almost as much potassium as a banana, and full of antioxidants, which keep skin firm and helps prevent wrinkles. Kiwifruit is a true superfood that is also featured in my e-book about superfoods which is part of the Natural Health Revolution Program, a program that will help you to achieve your health, nutrition and weight loss goals. 17. Green Tea – You’ve got good reason to curl up with a cup of green tea. This soothing drink is packed with antioxidants, and medical studies have revealed that the polyphenolic compounds in green tea are anti-inflammatory, and fight against the production of skin tumors. Read more about the health benefits of green tea and why you should drink more of it. 18. Yogurt – It contains vitamin A, which is essential for skin health. Yogurt also has fantastic probiotic qualities which can truly help your skin and slim your waistline. Also, some teenagers have reported that ingesting high probiotic yogurt, like kefir, is a natural cure for acne. You may also be interested to read my article about 9 reasons to take probiotics. According to a medical study walnuts are rich in omega-3 fatty acids that are reported to have beneficial effects on brain function. Just eating a quarter of a cup of walnuts increases melatonin and serotonin (5 HT) levels. These two brain chemical are connected to mood, sleep and cognitive functioning. In addition to this, walnuts are packed with B-vitamins which are conducive to smoother skin, shinier hair, brighter eyes, and stronger bones. Pop them on your salad, pasta, or dessert, or even chomp on them alone for a healthy snack. 20. Gelatin – an incomparable source of calcium, magnesium and phosphate. This jiggly treat aids hormone production and digestive health. It also reduces inflammation in joints and has loads of collagen for skin repair. This is the perfect dessert to top off your new healthy diet! Don’t forget that for the first few decades of your life, your epidermis renews itself every 30 days, but by the time you’re 40, it takes about 45 days. This slowdown is a reflection of your body’s gradual aging process, and even long before menopause, the same hormonal changes in your body will start to show their signs on your skin. So prepare yourself and try treating your hormonal skin issues from the inside out. Sugar. Sugar suppresses the immune system – if you regularly eat sugary foods and drinks throughout the day, then you are stopping your immune system from working properly. It also reduces the release of the human growth hormone, which accelerates the aging process. Excess caffeine. 200 mg of caffeine is said to increase blood cortisol levels (stress hormone) by 30% in one hour. Try alternative, caffeine-free beverages for two weeks, and see how you feel. Hormone-Infused Beef and Milk. Non-organic farms often inject their cows with growth hormones (rBGH) to increase milk production and promote faster growth. Meat or dairy coming from these injected cows are linked to increase the risk of breast, colorectal, and prostate cancer and potentially can also cause hormonal imbalance. You should also be aware of the other American foods that are banned in other countries. Alcohol. Alcohol consumption is one of the top 10 causes of premature aging of your face. It causes damage to the skin texture and color and has considerable influence on the eye sockets. Drinking excessive amount of alcohol causes bulged eyes and affects the skin due to the accumulation of toxic breakdown products in the deeper skin layers. This can cause the appearance of capillaries and redness of the cheeks and on the nasal bridge. Soy. Soybeans contain phytoestrogens, which act like natural estrogen and can seriously mess up your hormones. And not only women are affected. Men, children and newborns as well. For women, raised estrogen levels cause estrogen dominance which is linked to infertility, disrupt endocrine system, menstrual issues, and increased risk of cancer (especially breast cancer). There are many other health risks related to the consumption of soy based products. It should be noted that phytoestrogen are found in many other foods, such as broccoli and beans and not just in soy products. According to the Breast Cancer Fund, although scientific evidence suggests that plant-based estrogens offer nutritional benefits and are associated with healthy diets, the data are conflicting as to whether soy-based diets are beneficial, harmful or neutral in their effects on breast cancer risk. According to a study, phytoestrogens can work in various ways inside the body. While they mimic the effect of estrogen at low doses, they can actually block human estrogen at high doses. When checking the quantities of phytoestrogens in the foods, based on 100 grams of that specific food, you can see that soybeans contain a very high amount of phytoestrogen compared to other foods in the list. Hi Agi, acne can be very persistent in some people and difficult to treat. You can have a look at my article “The Best Herbs for Acne, Including Other Natural Acne Cures” – https://www.healthyandnaturalworld.com/natural-acne-cures/ – but if your situation is really difficult, you may need stronger applications from a dermatologist. Hi please tell me how to make coriander tea.my daughter and I have hormonal imbalance. Thanks the information will be much appreciated. Use 1 teaspoon of crushed coriander seeds to each cup of hot water. Infuse for 5 minutes. You can add cinnamon or ginger for added flavor. Let cool to warm before adding raw honey if you want.